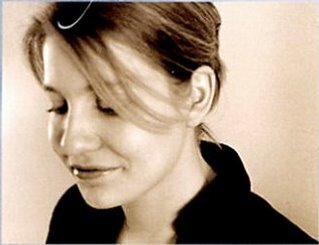 So to make up for missing a post about books this week, I thought I'd do double duty today and write about books and music. I was in our lovely downtown bookstore this weekend and was lucky enough to come across Lisbeth Zwerger's Swan Lake on the sale shelf. 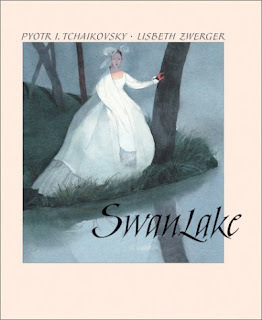 Zwerger's retelling of Tchaikovsky's ballet is beautiful in every way. The story of a woman who is transformed into a swan by an evil sorceror is simply told, and Zwerger's paintings are set in muted blues and grays that bring out the shroud of mystery that surrounds the tale. The illustration of the Swan Queen on the cover is particularly stunning. I wish you could see it better here, but the way the cuff of the sleeve makes her hand look like a swan and the dress feathers out just a little at the bottom...it's genius. There's another painting that shows the transformation of the girls into swans, and it is so odd and weirdly beautiful, it made me wonder why I never thought more carefully about the strangeness of that transformation--how awkward and bizarre it would actually be. Knowing the story, I was surprised to find a happy ending on the last page, but it turns out Zwerger did not simply tack that on. She goes on to explain that Tchaikovsky's original production of Swan Lake in 1877 did indeed have a happy ending. The production was terribly received. Critics thought the story was stupid and the music was too noisy. When the ballet was re-staged in the early 1890's, the ending was rewritten as a tragedy.